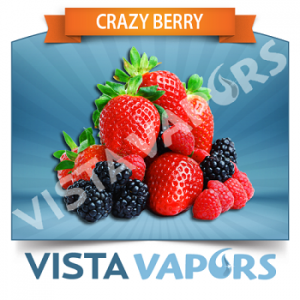 Vista Vapors Review – More That It Seems to Be? Disclosure: The vape juices which we review on this website are tested by our trained, paid staff. As part of the review, VapingDaily.com links directly to the product or brands so that you may purchase directly from the provider. We receive commissions from these providers, however, this does not affect the price you pay, and the commissions we earn help us pay for the costs of running this website. Thank you. Our Verdict: With its healthy selection of e-liquid and at affordable prices, Vista Vapors is one of the best places to shop for e-juice. From Bacon to Flavorless, and everything in-between, they have an e-liquid for everyone. Full-bodied flavor has never been easier to obtain, until now. ComplexPrice: $7.49/32 ml bottle Aside from the most ardent vegans, bacon is beloved by most. 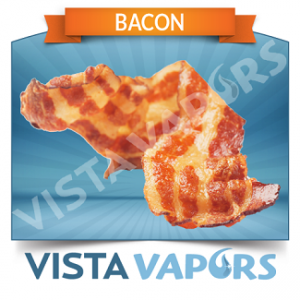 With Vista Vapors’ Bacon e-juice, users can take their favorite breakfast food anywhere. Sweet and smoky, this e-liquid recreates the meaty flavor of bacon in vapor form. A must try for all fans of bacon. 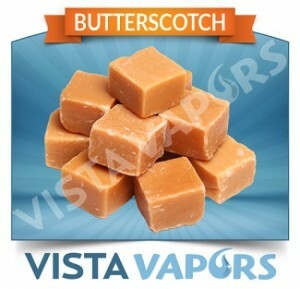 Strong and SweetPrice: $7.49/32ml bottle One of Vista Vapors’ highest rated e-liquid, Butterscotch is a blend of toffee, butter, and sugar that has a smooth and gentle flavor that doesn’t come across as too sweet. Perfect for candy lovers. Sweet and FruityPrice: $7.49/32ml bottle An e-juice that’s sweet, fruity, with a hint of tart, Crazy Berry is a combination of various berry flavors that tastes like a berry smoothie. Strawberry is the focus here, with hints of blackberry and blueberries. A satisfying vape for all berry enthusiasts. 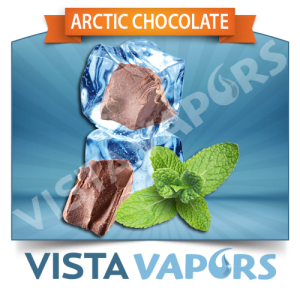 Sweet and CoolPrice: $7.49/32ml bottle A unique blend of menthol and chocolate, Arctic Chocolate is a flavor that will both soothe and satisfy your sweet tooth. A dominantly menthol blend with a touch of chocolate, vapers will love the vibrant and refreshing sensation this e-juice gives one’s throat. 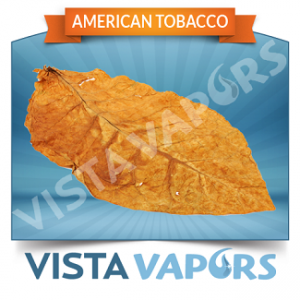 Pure TobaccoPrice: $7.49/32ml bottle Vapers who need the taste of tobacco to curb their craving for cigarettes will find solace in Vista Vapors’ American Tobacco. A pure tobacco flavored blend without any sweet or menthol flavors added, this e-juice is perfect for vapers who love the taste of cigarettes but loathes to get back into the habit. Brand: Vista Vapors is an American company based in Minnesota and is one of the fastest growing e-liquid manufacturers in the industry today. Aside from the healthy selection of flavors they offer, one of the reasons for the company’s rise to success is their dedication to providing perfect tasting, high-quality e-liquid at affordable prices. Over 160 flavors with customizable options are available, and the company also has a “Mix Your Own” feature with over four million possible combinations. While the brand does not have its own branded hardware, the online store does sell starter kits, tanks, atomizers, and mods that make them a one-stop-shop for all your vaping needs. With all the company has to offer, it is no wonder Vista Vapors is fast becoming one of the top brands in the vaping industry. Bottles and Flavors: Vista Vapors e-liquid come in pliable plastic bottles that are easy to squeeze, yet tough enough for transport in pockets and purses. However, 30ml bottles come in high-quality glass containers with a glass pipette. Labels are marked clearly with the ingredients, flavor name, and health warnings. Text are legible, and one does not have to squint to be able to read them. Bottles are individually shrink-wrapped to prevent tampering and to keep the contents fresh. Blend ratios are available at 50/50 PG/VG and 70/30 PG/VG. However, the company’s Vista Select line offers 10/90 PG/VG blends, perfect for users who crave massive clouds. While the ratios available may not be as comprehensive as other e-liquid brands, they are varied enough to satisfy most vapers. Nicotine levels are chosen during the ordering process, and the range of strengths include 0mg, 3mg, 6mg, 12mg, 18mg, and 24mg. For the Vista Select line, the available nicotine levels are similar, except for the 24mg variant. Users can also add to their e-liquid an extra flavor boost that start at 10%, going up to 50%. The level of customization for each flavor is impressive. Other brands just let users choose what they have in stock, whereas Vista Vapors give its customers free range to customize as they please. Though not stated explicitly, this means that Vista Vapors e-liquids are mixed and blended fresh, according to users’ tastes. A good sign that the company values customer satisfaction above all else. All flavor groups are well-represented here as well, with a dizzying array of flavors that include dessert, candy, drinks, fruit, menthol, tobacco, and many more. Users will find whatever flavor they need here, and if not, they can mix it themselves using Vista Vapors own “Mix Your Own” feature. Vapor production is mostly dependent on the power of the e-cig or mod used, the setup of the atomizer, and the amount of VG in an e-liquid. However, all things being equal, the default 50/50 blend of Vista Vapors produced decent clouds when used with a regular 3.7v e-cig with a standard atomizer. More clouds can be generated with a different setup, but at its most basic, Vista Vapors e-liquid performs great. When it comes to e-liquid, Vista Vapors has it all. From sweet candy delights to bacon, sophisticated dessert blends to pure tobacco, the range of flavors Vista Vapors has in store will make any e-juice fan squeal in delight. Customizable options are complete, where users can choose VG/PG ratios, nicotine strengths, flavor boosts, and bottle size. Of course, there’s the “Mix Your Own” feature that allows users to blend mixes of their creation. The number of flavors available to vapers is virtually limitless. Then there’s the price. At $4.99 for 17ml, Vista Vapors e-liquid is one of the more affordable US-made e-liquids one can find. For other brands to compete at this price range, they’d have to sacrifice quality. At Vista Vapors, users get high-quality, flavorful e-liquid at a price that’s hard to resist. They even have an ongoing special that offers 10ml e-liquid for just $2.99. A fantastic deal however you look at it. Users who seek an e-juice vendor with a healthy selection of flavors, high level of customizations, top-shelf quality ingredients, flavors that rival the best in the business, at affordable prices, need not look further. Vista Vapors e-liquid is here to stay, and it has no way to go but up. Poised to become a strong contender on the vaping scene, Oplus brings new standards and strong flavors the game. Read our review to learn more. Mt. Baker Vapor is known for their affordable line of e-liquid. Find out if their e-liquid is the best bang for your buck. I will agree with you that they have a pretty decent selection and their pricing is very competitive. However, this is where the seemed bargain quickly disappears. Let’s say your order totals anything above the $50 mark as to qualify you for free shipping. Now let’s say you have a coupon or a promo code and any other measure that brings your total down below the $50. You will now be charged $6.50 for shipping because you fell below $50 even though the original purchase was over that. Example; I was about to purchase $75 worth of product. I applied their cyber Monday code which brought my order down to just pennies under $50. So I was going to be charged a minimum of $6.50 for shipping. The only way to overcome this was to add on to the order sufficiently enough to make sure the total wouldn’t fall below $50 after the discount was applied. WTF is that? I buy from dozens of retailers online and NONE of them do business this way. I’ll shop elsewhere.